Arjuna was as devoted to Krishna as Hanuman was to Rama. Out first story based on a folktale popular in South India is about the encounter between Arjuna and Hanuman, both of whom come to realise that Rama and Krishna are one and the same. Arjuna was trained by Drona, the master of archery and acquired powerful weapons by propitiating the gods. 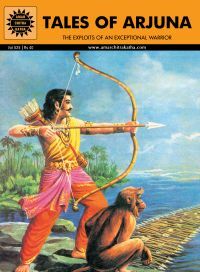 But the weapon that made him invincible was his mighty bow, Gandiva, which he obtained from Agni. Arjuna, and his cousin Krishna were inseparable and it was to Krishna that he always turned to for guidance. In the battle of Kurukshetra, Krishna acted as Arjuna's charioteer. There were, however, occasions when Arjuna became vain and boastful. The third story in this Amar Chitra Katha shows how Krishna gently, but firmly, corrected Arjuna on such occasions.